A Web Browser just for kids! 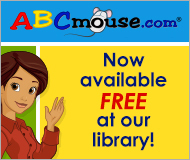 ABCmouse is now available at the North Shelby Library! This award-winning ABCmouse.com curriculum is designed to help young children (ages (2-6+) build a strong foundation for future academic success. ABCmouse.com is 100% educational, with 3,500+ learning activities acreoss all major subject areas-reading, math, science, social studies, art and music. Best of all kids love it. And it's free to use in this library! From Age of Learning, Inc. Call 205.439.5504 for any questions about this resource.